The IMZ M-72 is a Soviet sidecar motorcycle that was made by the IMZ for the Red Army during the Second World War. The bike continued to be produced for the Red Army after the end of war but the military version was made by the Kiev-based KMZ factory (from 1955), while the IMZ produced civil versions. In 1957, it was succeeded by the M-72M but the original M-72 continues to be produced in China to the present-day. There are two versions about the development of the M-72 sidecar motorcycle. 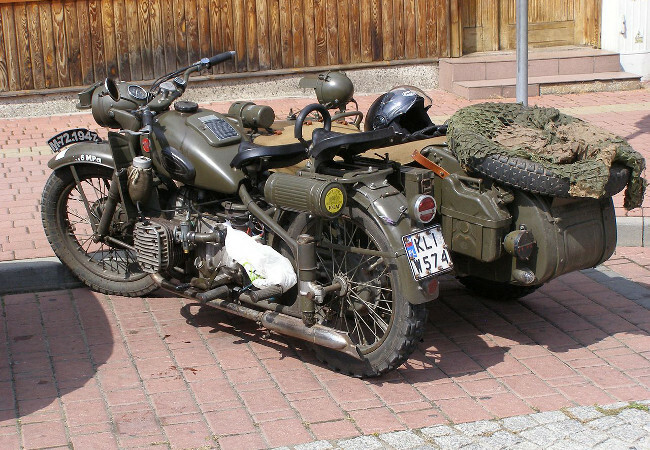 According to one story, five BMW R71 were smuggled into the Soviet Union in 1939 and used as a basis for the M-72 which was first produced in 1941. The prototypes were shown to Stalin who gave a green light for the mass production. According to the second version, the BMW R71 construction plans were given to the USSR by the Nazi Germany after the so-called Molotov-Ribbentrop Pact, signed in 1939. Either way, the Soviets developed the M-72 with reverse engineering which was actually quite common at the time. For example, the Harley-Davidson XA was based on the BMW R71 as well. Shortly after the first M-72 was presented to Stalin, the Soviet Union was attacked by the Nazi Germany and the production of the bikes moved to the IMZ factory in a small town of Irbit in the Ural Mountains. After the end of war, the IMZ continued to produce M-72 for the Red Army until 1955 when the production moved to the KMZ factory in Ukraine. The IMZ produced M-72s for civilian use until 1956 and then a similar model called the M-72N. As mentioned earlier, the M-72 production moved to China in 1957. Due to the Cold War, the Ural (Russian) and Dnepr (Ukrainian) sidecar motorcycles became available in the West only in the 1970s. In the UK, they were imported and distributed from 1973 and 1979 by the Satra Motors, a subsidiary of the Satra Corporation which was the official importer of Soviet motorcycles and cars in the UK, US and Australia.